Discovery has retained both Morrison & Foerster and Young Conaway Stargatt & Taylor to represent it. 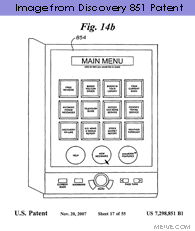 The underlying patent (which is embedded below along with the court filing) is dubbed the “851 Patent” for the case but officially numbered #72298851. It was filed September 21st, 1999 and lists Discovery founder John Hendricks among the three named inventors. "The technological breakthroughs of this invention provide a secure electronic system for both delivering selected books and receiving payments… The purchase of a book becomes a pay per read event avoiding the overhead, middle-men, printing costs, and time delay associated with the current book distribution system." "the viewing device may be a portable book shaped viewer which securely stores one or more books for viewing and provides a screen for interacting with the home library unit. A high resolution LCD display is used to both read the books and to interact with the home library software"
"The system is a novel combination of new technology involving the television, cable, telephone and computer industries. It utilizes high bandwidth data transmissions, strong security measures, sophisticated digital switching, high resolution visual displays, novel controls and user friendly interface software." Given Discovery’s core TV businesses, some may question what Discovery is, or was, up to in pursuing digital books. It’s a fair point. That question may not be answered but it does appear the patent stems from the personal interests of Discovery’s founder and Chairman John Hendricks. During the 1990’s, Hendricks was a prolific inventor and frequent contributor to the workload of patent examiners. Much of his focus was TV related but not all. 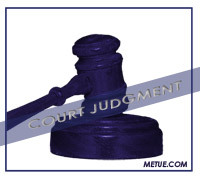 Searches reveal he was granted patents on work ranging from targeted advertising methods, to cable TV controllers, TV remote controls, and the e-book work. On e-books, prior to the 851 patent, US. Patent 402310 was also filed by Discovery. It was filed in 1994 and granted in 1998. It focused specifically on the shape and design of an e-Book reader. The TV patents were reportedly sold off in 2004 but Discovery held on to the e-book rights. It’s unclear if there was a plan to go from paper to product with a Discovery Reader but Kindle’s success has been enough to drive Discovery to claim ownership, regardless. At this point, nothing suggests parallel suits are being considered against Sony or other vendors whose e-book platforms could be alleged to infringe similarly. Discovery is focused on Amazon and the Kindle; seemingly going after the highest profile target first. Amazon has not yet commented on the suit. In other patent related news… The US District Court in Texas has thrown out a case filed by Texas based Fenner Investments that alleged Nintendo’s Wii and Microsoft’s Xbox game platforms infringed on its patents. The suit had originally been filed in 2007. The original complaint had also named Sony but Fenner amended it two months later to remove them. 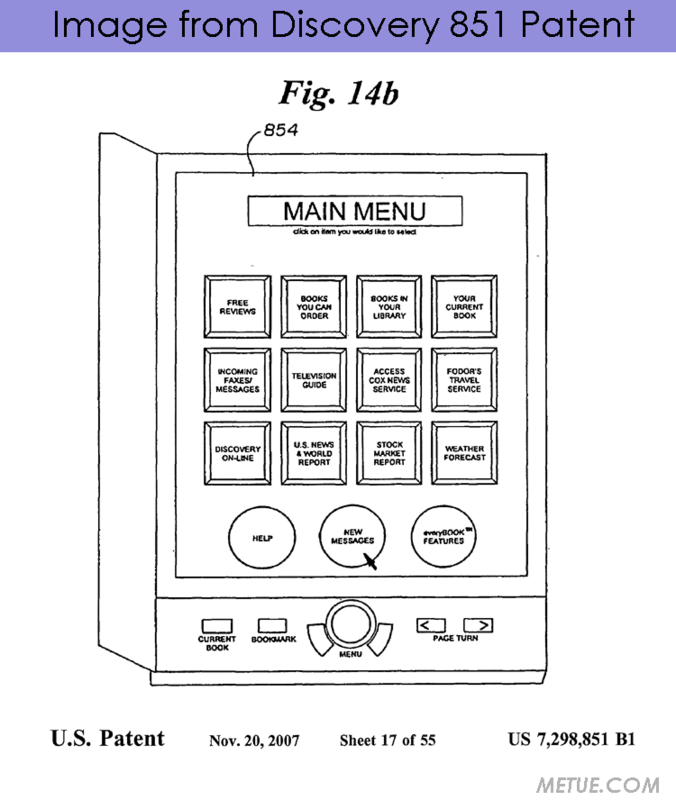 The underlying patent, #6297751, applied to low voltage joystick interfaces.